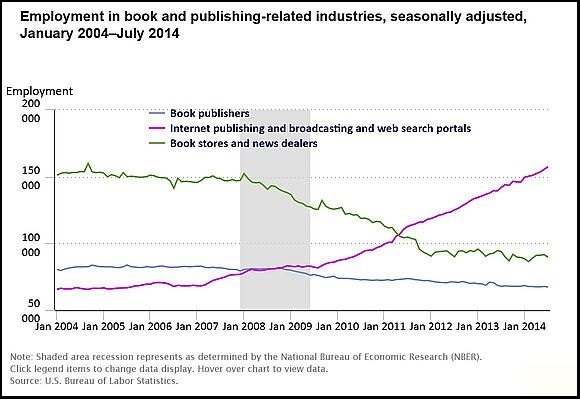 The latest data from the U.S. Bureau of Labor Statistics (BLS) shows that employment in the book publishing industry dropped by over a quarter (25.7%) since spring 2006 and nearly a third (32.5%) from its peak 20 years ago. 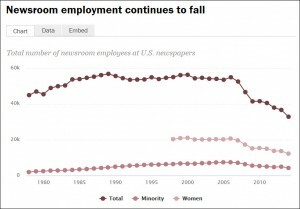 It could be worse: the newspaper industry lost 60% of staff since 1990. Periodicals lost 36%. The data appears in a June 2, 2016 bulletin from the BLS. Like all data the reports from the BLS are fraught with idiosyncrasies. For example, when you look at the employment by occupation you’ll see included an assortment of behind-the-scenes workers, such as security guards and “Office Clerks, General.” And there has been lots of criticism of the department’s unemployment statistics. Of course it misses most if not all of the employment of self-publishers: although should they be classified as “Writers and Authors” or as publishers? What makes the data valuable is that it’s from a single source covering over 25 years. That alone makes it worth considering as part of the picture of the health of the U.S. publishing industry. 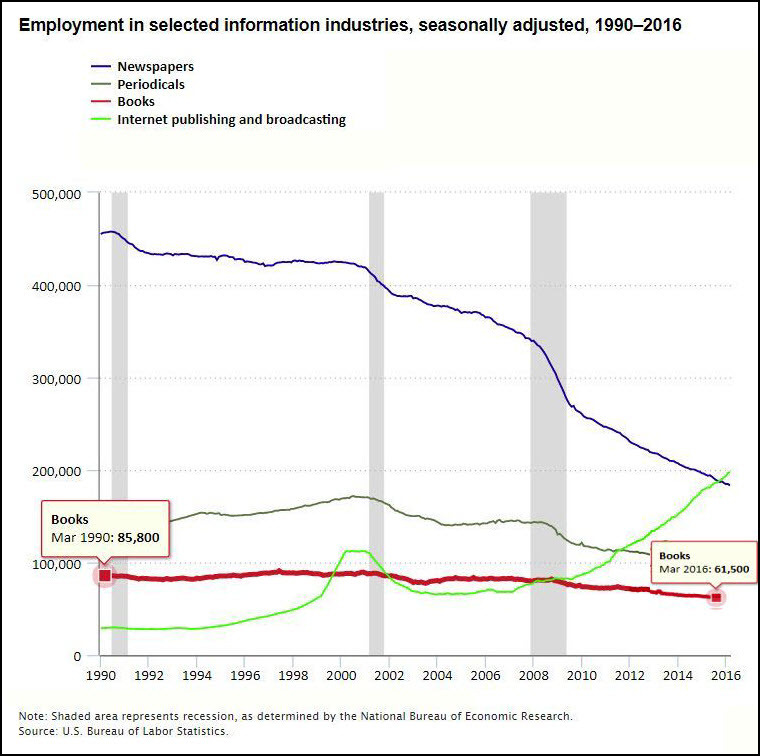 January 21, 2019: I found another data set today, covering “Employment in book and publishing-related industries, seasonally adjusted, January 2004–July 2014.” This breaks down employment at “book publishers” separately from “Book stores and news dealers.” Employment at book publishers declined by 16.5% in this period, but at book stores and news dealers by 40.7%. Next I’ll have to find data to separate book stores from news dealers. Another data point: On June 15 the Pew Research Center on Journalism & Media released its highly respected annual report, State of the News Media 2016. It is grim but essential reading. The report offers a comprehensive look not just at newspapers but at news media, and so includes broadcast news, both TV and radio, digital news, news magazines and more. The full report (PDF) is 118 pages, but a number of summaries are available as fact sheets. Relevant to this blog post is data on newspaper employment. Unlike the BLS stats which consider all employees at newspapers, the Pew report details just newsroom staff. 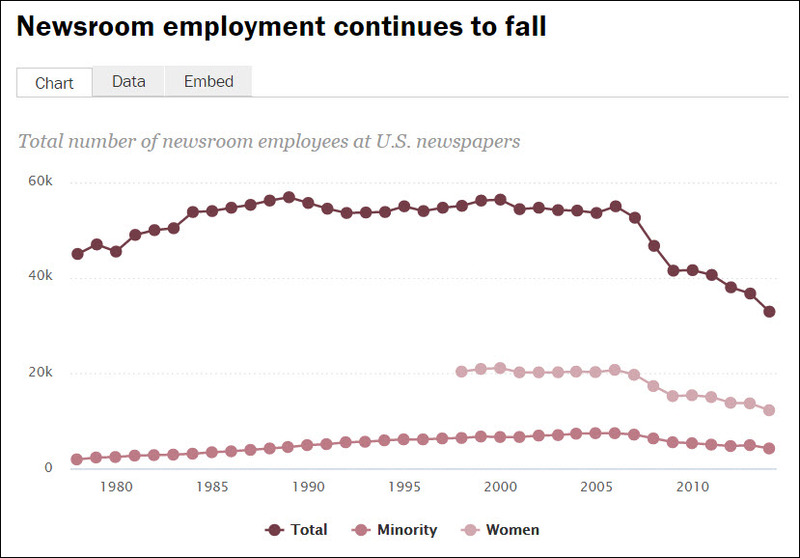 From its peak in 1998, newsroom employment had declined by 42% to 2014. It’d be interesting to be able to pull out of the data any indication of how much these changes are due to changes in income versus greater efficiency in publishing. For newspapers and magazines, lower income has clearly forced major layoffs. Book sales haven’t changed that greatly, so more of the shift may be due to greater production efficiency. I know that when I worked for a major publisher in the late 1990s, its workflow seemed to be circa 1987. I certainly hope that’s changed. Incidentally, the problems with even figuring how what this data means is one reason why command economies (i.e. communism and the more meddling socialism like than in the EU) work so poorly. Those in far-away government offices don’t even know what’s happening much less what needs to be done. Yes, this data just makes you hunger for more. As you note, book sales have not changed all that much: based on another set of (wobbly) data they appear to be essentially flat (or down slightly) for more than a decade. There have been many layoffs among the largest publishers, some announced, others that I hear about from friends and colleagues. Are they doing more (or the same) with fewer people? Probably so. And yet the employment for the same jobs is on the rise in India. That’s where the publishing jobs have gone. The jobs that were done in the US are done overseas to save money. Typesetting, editorial, design, etc. positions are done elsewhere. Why pay a US living wage when you can get the work done for pennies on the dollar. @L. Roberts: It’s true that much of the typesetting and layout for books is now done offshore, mostly in India. Yes, the prices are lower: in my experience by roughly two-thirds. The quality is excellent. On the other hand editorial and design is rarely sent offshore. But because book typesetting and layout has historically been mostly outsourced in the United States, those positions would not show up in book publishing employment figures and so would not be part of this calculation.